The extensive system of currents in the Atlantic Ocean, bringing warmth to Europe and transferring cold waters to the equator, has slowed in past couple of decades. This can lead to global climate changes, and the climatologists have sounded the alarm in a recent article published in Nature Climate Change magazine. Furthermore, slowing currents are rising the ocean level, which will affect cities along the cost like New York, Boston, and the temperature changes will affect the weather on both sides of the Atlantic” – explained Stefan Ramshtorf from the Potsdam Institute for Climate Impact Research. 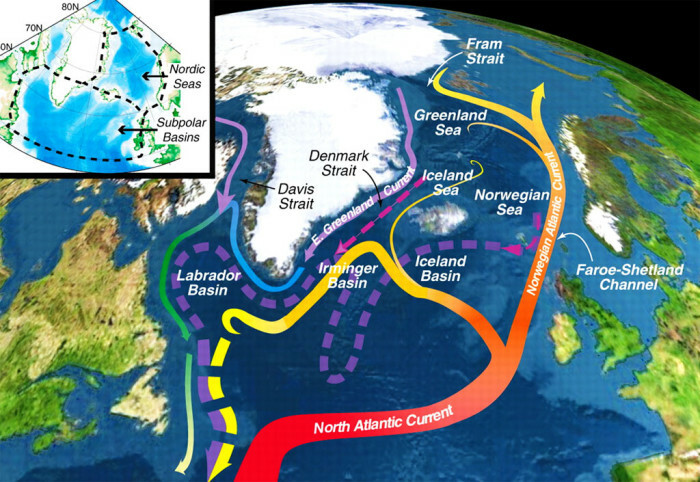 When they compared the dynamics of the recorded changes of temperature in the surface layer of the ocean in this region in contrast to the other parts of the Atlantic, oceanographers found that the conveyor currents are actually slowing down with a record pace in the last decade. Much of this delay, according to data from ice samples is in the last 30 years. The possible reason for this slow down, are climate change and massive melting of Greenland ice. The melted ice lowers the density of the cold arctic waters and prevents the flow of a warm North Atlantic Drift to rise up and cool and then start flowing back toward the equator, thus slowing down the ocean conveyor. According to scientist’s calculations, if the melting glaciers of Greenland continue to accelerating in the coming decades, it is more than likely for the conveyor of currents in the Atlantic to stop. This will lead to strong and irreversible changes in the Earth’s climate. The scientists are trying to assess the consequences of such catastrophe and understand the possibility to avoid it.